This proper wooden pub in Bath, where you can go for a fun evening with friends. 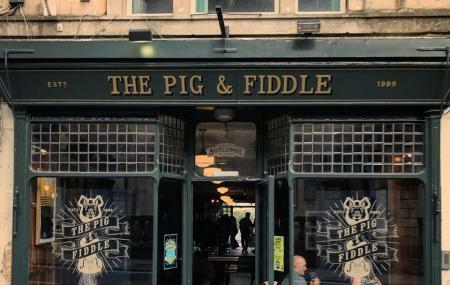 A favorite among locals and visitors alike, the Pig & Fiddle is a common feature in Bath’s nightlife and popular culture, which you cannot miss. Catch a game of rugby at the large screens, and amidst the rambunctious crowds of the town. During the winters, enjoy a pint of freshly brewed beer at the outdoor beer garden, with heated umbrellas. This is one place which will keep you warm in the winter and keep warmth in your heart throughout the year. How popular is The Pig & Fiddle? People normally club together Riverside Cafe and La Tasca Spanish Tapas Bar - Bath while planning their visit to The Pig & Fiddle. Lovely venue but the ale selection is becoming increasingly 'on trend'. Neglecting those of us who like something a bit more traditional. Still a nice enough place for a few drinks though. Very nice and cool place, in the centre of the city. If you are around Bath it's a perfect place to have a quick snack or lunch. Quality of food is high, personally I had the fish and chips and I couldn't have ordered better. People very welcoming. Prices were really fine. Highly recommended. Leaves a bit to be desired. Staff seemed to be interested in chatting to their mates than serving customers. Decent pub with good beer selection and mixed crowd. Buzzy atmosphere most times of the day and a few screens for sport, but could do with a good clean, always feels very grotty. Nice outdoor seating area.